A career in social media is promising, creative and rewarding. Whether you want to develop your skills as a social media coordinator, analyst or marketing manager, knowing what to put on your professional resume can be tricky and knowing what way to format it can also be time-consuming. We’ve put together a small guide below for all social media resumes. Putting together the right resume for media jobs is hard but our list gives a break down on what to include and some tips and tricks to help you and your future social media career. This means potential employers can see why they should hire you at a glance. Employers will be looking out for campaign management, creation, execution and experience in the relevant social media analytics. Having your key skills at the top of your resume is a brilliant way to get an employer’s attention and encourage them to continue reading your resume. The skills list can be simple bullets or give a little more detail, whichever works for you. Managers want to know that you are up to date with the latest social media management tools. Show them you know how important planning is for any successful social strategy, and show them why. If you don’t have experience using all of the planning tools be sure to familiarise yourself with the platforms before applying for any role. Some of the most popular social media management tools are Hootsuite, Buffer, Sprout Social, Tweetdeck, IFTT and Later. Make sure to highlight that yes, you have the experience in social media scheduling and management, but you also know the backbone of any good social media is analytics. Analytics show if a campaign is working, or if it isn’t and is crucial for understanding good social media and how to build on or improve social strategies. Include analytics in your key skills and do your research on popular analytic tools such as Buzzsumo, Tailwind, Google Analytics and Crimson Hexagon. Social media campaign increased page likes by over 50% and grew engagement with the page by 22%. Don’t worry if you don’t have all the skills just yet. Everyone has to start somewhere. 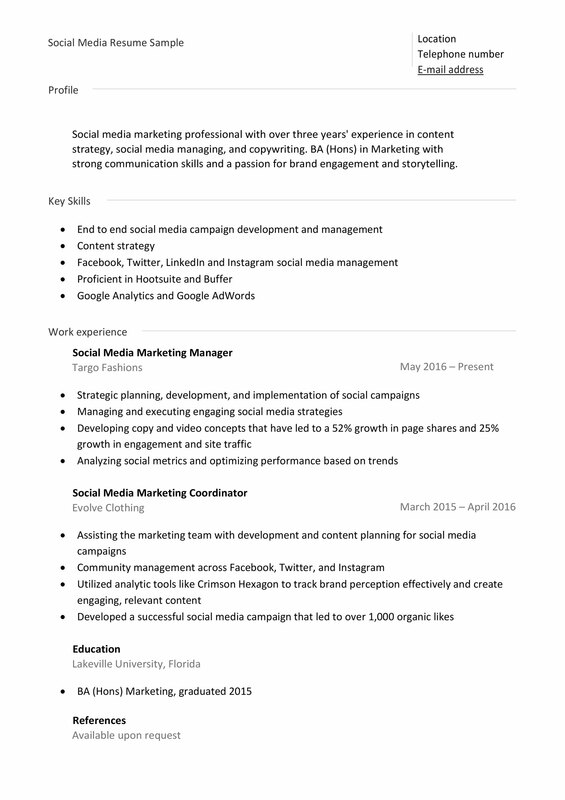 If you are applying for a social media coordinator role and are just out of college or looking for a career change, research the role and use any relevant experience to help leverage your resume. For example, if you love what a brand is doing on social, talk about this in your professional cover letter. Why do you like it? Is it the good copy, video style, how the brand talks to its customers? Show that you understand the importance of good content and you are eager to learn more. Use your own personal experiences, do you have a personal blog? Or were you involved in any university societies, and did they require any social posting or writing? Read the job description carefully and try to relate all of the points back to the skills you have. If social media analysis is more up your street, make sure to highlight you’re knowledgeable in quantitative and qualitative research, SEO and the analytics systems mentioned earlier in the article. You need to show a potential employer that you know how important research and media planning is and how it has an impact on making better social media campaigns. A social media analysts resume should highlight experience in putting together well-researched reports and using these reports to make future campaigns better. Show them your key skills, use social media jargon (think implement, deliver, analyze, monitor), know your social media platforms and your analytics, show them you’re a media specialist. Be excited by what the company offers and what you can bring to their social media strategy and your resume will no doubt stick out in the crowd.